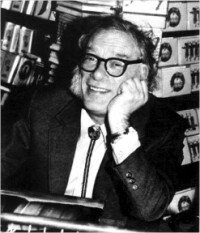 Isaac Asimov wrote or edited more than 500 books. He is widely considered a master of the science-fiction genre and, along with Robert A. Heinlein and Arthur C. Clarke, was considered one of the "Big Three" science-fiction writers during his lifetime. He penned numerous short stories, among them "Nightfall", which in 1964 was voted by the Science Fiction Writers of America the best short science fiction story. He also wrote mysteries and fantasy, as well as a great amount of nonfiction. Asimov wrote the Lucky Starr series of juvenile science-fiction novels using the pen name Paul French. Asimov was a long-time member and Vice President of Mensa International, albeit reluctantly; he described the members of that organization as "intellectually combative". He took more joy in being president of the American Humanist Association. The asteroid 5020 Asimov, the magazine Asimov's Science Fiction, and two different Isaac Asimov Awards are named in his honor. Much of Asimov's fiction dealt with themes of paternalism. His first robot story, "Robbie", concerned a robotic nanny. "Lenny" deals with the capacity of robopsychologist Susan Calvin to feel maternal love towards a robot whose positronic brain capacities are those of a 3-year-old. As the robots grew more sophisticated, their interventions became more wide-reaching and subtle. In "Evidence", the story revolves around a candidate who successfully runs for office who may be a robot masquerading as a human. In "The Evitable Conflict", the robots run humanity from behind the scenes, acting as nannies to the whole species. Later, in The Robots of Dawn and Robots and Empire, a robot develops what he calls the Zeroth Law of Robotics. The End of Eternity, features a similar conflict and resolution. The significance of the Zeroth Law is that it outweighs and supersedes all other Laws of Robotics: if a robot finds himself in a situation whereby he must murder one or more humans (a direct violation of the First Law of Robotics) in order to protect all of humanity (and preserve the Zeroth Law), then the robot's positronic programming will require him to commit murder for humanity's sake. Only highly advanced robots (such as Daneel and Giskard) could comprehend this law.